Texas providers have waged a 20-year battle with the OIG over Medicaid UR. Is it time to claim victory? When Texas Governor Greg Abbott signed Senate Bill 207 into law in June, he effectively enacted a truce in a 20-year war between providers and the state's Office of the Inspector General (OIG) over the latter's approach to Medicaid utilization review (UR). Language contained within the new law clarifies criteria for Medicaid fraud investigations and requires auditors to follow federal coding guidelines during the diagnosis-related group (DRG) validation process—the same guidelines providers are required to follow. "In what other state do you have to make a state law to force the state to follow federal law?" asks Judith Kay Sturgeon, CCS, CCDS, clinical coding/reimbursement compliance manager at Houston's Harris Health System. When the odyssey began in the early 1990s, no one could have predicted that it would last as long as it did or eventually require legislative intervention. Getting to the governor's desk ultimately spanned two decades and multiple inspector generals. More impressive, it required the unwavering determination and collaborative resources of the Teaching Hospitals of Texas (THOT), Texas Hospital Association, American Hospital Association, University of Texas Medical Branch (UTMB), Texas Health Information Management Association, Texas Medical Association, and numerous public and private health care organizations. The Texas OIG is tasked with carrying out UR of hospital claims, a responsibility the Texas Medicaid Provider Procedures Manual defines as assessing the medical necessity of the admission, conducting a quality of care review, and validating the DRG used in the claim as supported by the medical record. According to the THOT and other provider representatives, the problem lies with the OIG's approach to validating DRG codes. Specifically, the agency uses unpublished criteria and does not consistently follow federal coding guidelines, which creates a domino effect that impacts far more than providers that may be subject to inappropriate recoupment. According to a THOT background document, "Medicaid payments as well as state and national quality data and benchmark reporting depend on the accuracy of the DRG codes. By failing to consistently follow the national standards, the OIG's DRG validation process results in incorrect coding of Medicaid claims, inappropriate provider recoupments, and inaccurate quality reporting, inability to perform [accurate] national benchmarking, and the potential for an inaccurate view of the Texas Medicaid population nationally." The process forces hospitals and physicians into a reactive position, unable to proactively address bona fide issues and concerns, and it increases costs and administrative burdens, according to the THOT. It requires providers to essentially adhere to two sets of competing coding criteria: the published federal standards and unpublished OIG standards. Thus, when providers follow federally mandated and industry standards, they are subject to OIG denials and recoupments. Further, provider representatives charge, when the OIG changes codes based on its unpublished guidelines, payments are inappropriately reduced. As a result, the state's DRG methodology no longer results in accurate provider payments and DRG-based national benchmarking and quality standards are inaccurate. "Often, a very unintentional set of errors triggered a cascade of reactions from the OIG based on their definition of fraud," says Oscar "Skip" Brown, MD, FAAP, vice-chair of clinical services and chair of the Texas Chapter of the American Academy of Pediatrics, and a clinical professor in UTMB's department of pediatrics. "That cascade could be triggered by using the standardized set of coding that had to do with the DRG claims billing. Coders are required to follow federal coding guidelines. [The OIG] office had been using something else, inserting their own clinical judgments instead of federal guidelines, which resulted in a very difficult-to-manage and very expensive process." The OIG office disputes those assertions. According to Communications Director Chris Cutrone, the agency's UR process is based on criteria in the Texas Administrative Code 371.203 and from published policy in the Texas Medicaid Policy and Procedures Manual. Further, "If the DRG is not validated, the claims are adjusted according to the process specified in the rule," he says. The OIG doesn't determine fraud in the UR, Cutrone says. "It identifies potential fraud, waste, and abuse and refers it to our Medicaid Provider Integrity unit in our Investigations division," he says. • incorrect reporting of noncompliant provider coding to the Centers for Medicare & Medicaid Services (CMS) and the OIG. "If a provider is using terminology just to avoid being placed under review, then the accuracy of the original information has to come under question. That makes for bad information," Brown says. "If that information is then used for studies or public health management, you can't do it very well because you know there's a flaw. It becomes an upside down pyramid. It starts small, with a change in the code, but then it potentially becomes a significant change in expenditure of dollars and perhaps toward the wrong goal." The first salvo in the 20-year battle was fired in the early 1990s when a group of Houston hospitals prevailed in a lawsuit against Texas Medicaid over its auditing methods. However, the case was not the catalyst for change that many had hoped. In particular, UTMB Galveston continued to battle the Texas Health and Human Services Commission (HHSC) for another 14 years. Then, without fanfare, the agency switched Galveston and two other state-owned hospitals to payments based on the Tax Equity and Fiscal Responsibility Act (TEFRA) rather than DRGs. According to the CMS, TEFRA facilities are paid on the basis of Medicare reasonable costs per case, limited by a hospital-specific target amount per discharge. Each hospital has a separate payment limit or target amount calculated based on the cost per discharge in a base year. Despite the change, "We still had the problem that the audits were five years behind the current discharges, so we still appealed a lot of cases that were getting DRG changes from the days before the payment changed," says Sturgeon, adding that compliance officers from several hospitals repeatedly attempted to explain to auditors that "When Medicaid claims that [it's] recouping 'payment errors' to CMS, they are accusing the hospitals of fraud. But if we have coded the cases according to CMS coding guidelines, they are not payment errors. They are, 'Medicaid decided five years later that they really don't want to pay that much for a short-stay mom or baby.'" In 2007, the hospital industry and the OIG reengaged in discussions, which continued for another three years. Each time, the OIG agreed to work with the industry to resolve the issue, but changes were minimal and typically short lived. In 2013, the THOT worked with hospitals and brought the HHSC into the discussion. During this round, the provider battalion engaged in multiple exhaustive meetings with Medicaid/CHIP (Children's Medicaid) and OIG staff. Audited cases in which OIG findings were not corroborated were reviewed, independent experts were brought in, and input was solicited from state and national experts regarding the effects of the OIG's failure to follow coding guidelines. The result was the HHSC Council directing the OIG to come to a resolution with the industry—which never happened, forcing the state government to become involved. "The biggest obstacle was that it's so complicated," says THOT president and CEO Maureen A. Milligan. "You needed to know the details to be able to support your assertions. It took a long time even for me to understand it and to figure out how we talk about this with OIG, with people who are doing [the audits] all the way up to inspector general. We had to figure out how to communicate all of this, so we had to first understand the process and then be able to lay it out." Exacerbating the situation was the discovery that "the OIG would make independent assessments not consistent with how they should be based on federal coding guidelines," Milligan says. Part of the battle was to identify the authority by which the OIG staff was able to make its assessments independent of federal guidelines. The THOT was informed that the agency had a Superior System Waiver (SSW), which waives certain federal utilization review requirements for acute inpatient hospitalization. It took the THOT several months and open record requests to the CMS to obtain a copy of the SSW. "The waiver was so outdated that it included things from the 1980s," Milligan says. "It was like pointing into a fog. It's hard to figure out the discrete pieces that [the OIG] argument was based on. They just said, 'This is our job. We're doing it. We have the authority to do it.' It was like pointing at things you could never quite put in a box." Meeting after meeting with committees and councils wound up in the same place: a he said-she said situation in which the bottom line was always concern over instances of fraud and inappropriate claims, but no guidance on how fraud was being determined. As one hospital compliance officer said to Milligan in frustration, "If you don't want us to follow federal coding guidelines, fine, but tell us what the guidelines are." "That was just one of the tendrils. We had to pick up each and ferret them out," Milligan recalls. While the war between the industry and the OIG waged on, individual providers were fighting their own battles to keep their Medicaid reimbursements while dealing with fallout from the OIG's approach to DRG validation. According to Brown, many observers believed teaching hospitals were suffering the most, but in reality the dispute affected all providers. "In order to provide access to patients covered under Medicaid and Medicare, everything must be done in a highly efficient manner because there is very little margin with those accounts," he says. The resources required to defend against audits stemming from what was essentially a failure to use common terminology often consumed those margins and more. What's more, it placed the onus on providers to return reimbursements that would never have been issued by Medicaid had they been handled properly in the first place. Or they find themselves in the crosshairs of a fraud investigation. "There was a lot of miscommunication of things like that going on. No one was really intending to defraud anybody," Brown says. At Children's Medical Center Dallas, the struggle was figuring out how to align with OIG mandates while complying with federal guidelines and still capture the accurate summaries of care necessary for effective population health initiatives. Katherine Lusk, MHSM, RHIA, Children's Medical Center's senior director of health information management and exchange, notes that following federal guidelines allows data to be normalized, providing a solid foundation for benchmarking care delivery. In addition, the data can be used for syndromic surveillance, public health monitoring, cataloging birth defect registries, and research efforts. However, the conflicting information provided by the OIG often created situations in which diagnosis codes reflecting documented comorbid conditions were not allowed, which in turn impacted DRG assignment. This resulted in reimbursements being lowered due to a decrease in severity of illness. "The hospitals felt strongly that not assigning the ICD-9 code in these instances would have served as an incomplete summary of the care delivered, as well as impact the many other venues in which the ICD-9 codes are utilized," Lusk says. "As hospitals partner with the state and federal government in population health, it's very important that we understand the disease and disorder prevalence. Removing ICD-9 codes creates an incomplete database from which to draw conclusions. "The assignment of the diagnosis codes affects more than reimbursement. There was concern about impacting the use of this normalized data across many fronts," she adds. The new legislation opens the door to a number of reforms, starting with the establishment of clear criteria for Medicaid fraud investigations by the OIG. "The bill clarifies [that] the definition of fraud does not include unintentional clerical errors," Brown says. "It does clearly state that probable cause is necessary for things like payment holds." The OIG is also mandated to provide physicians with a detailed explanation of evidence relating to fraud allegations. In addition, OIG investigations must be completed within 180 days and physicians have 10 days to request a confidential, informal settlement meeting. Perhaps most importantly, the new legislation requires Medicaid and the OIG to follow the same federal coding guidelines to which providers are held. The signing marked a strategic victory for providers in a seemingly endless war that had even the most determined suffering from what Milligan describes as "issue fatigue." But victory may be short lived. According to Milligan, a preliminary draft of the rule resulting from the legislation sparks a sense of déjà vu. "They structured it the same: 'We'll follow coding guidelines, but we'll add our special sauce,'" she says. "I don't know what it means for providers [yet], but the nice thing is that we have all three associations on board: teaching, children's, and general hospitals, both public and private and for-profit and nonprofit. All across the state, [providers] are engaged. There's no question, technically, on this. It's just a matter of getting [the OIG] to comply." Still, hope remains. Cutrone notes that while Senate Bill 207 directs the office to educate providers on DRG validation criteria, in actuality "provider input in this process has been under way for quite some time." Further, Milligan points to a healthy relationship with Texas' new inspector general, "who is committed to working transparently with providers. We hope our joint work for accountability will serve Texans and bring a happy ending to our story." Like many others, Lusk is eager for that day to arrive. "The change, when instituted, provides a consistent standardized approach for assignment of ICD diagnosis and procedure codes aligning with national guidelines," she says. 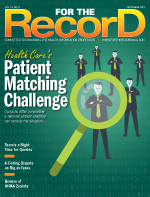 "The ability to capture disease and disorder prevalence amongst our population is enhanced, allowing Texas providers the opportunity to accurately benchmark with peers nationally and a solid foundation for managing a population."